"Although this wasn't my first time here, it was my sisters. She thought it was brilliant and I really enjoyed it too because I realised the exhibits were not the same as I'd seen before do its good they change them around, to be more current I think"
Welcome to LondonTickets.ie, where you can buy tickets to attractions or for transport in and around London – all before you leave Ireland. Easily buy transfer tickets between Central London and the three London Airports; Stansted, Gatwick and Heathrow. Skip the long lines of people queuing for attractions like Madame Tussauds, the London Eye, the London Dungeon, the Tower of London, & St. Paul’s Cathedral. Get your tickets here at great prices, before you leave Ireland and have more time to enjoy all of the fun and excitement that London has to offer. Get the most out of your time in London with one of our discount packages and great offers. Choose between the popular London Pass, entrance tickets to best-selling attractions like Madame Tussuads and the London Eye or our exclusive London Combo Deals where you can save up to 60% on your total ticket purchase! Play to your heart’s content at the LEGOLAND® Windsor Resort with over 55 interactive rides and attractions. Fly through the treetops to escape fearsome dragons, ride the thrilling rapids with a Viking Fleet, or join LEGO® divers on a magical underwater adventure. 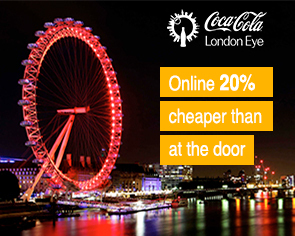 Experience one of London's top attractions and enjoy the incredible view of London from the top of the London Eye! Add a glass of champagne to your Ferris wheel ride or a sightseeing cruise on the Thames to make your day even more memorable. Book your tickets here and save up to 20% off the price at the door! The London Pass provides free entry to over 60 top attractions, tours, museums and sights in London and Fast Track Entry to a selection of the most popular attractions. Choose between 1, 2, 3 or 6 day options. Save time and money with the London Pass!